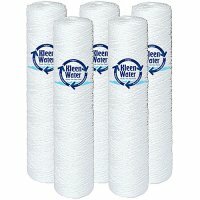 Five 4 1/2 X 20 Inch 3M Aqua-Pure AP-814-2 Alternative Water Filter Replacement Cartridges by KleenWater. Four 4.5 inch x 20 inch water filter alternative cartridges. The string wound polypropylene construction effectively removes dirt and sediment with impressive flow rates of up to 40 gallons per minute. The precise geometric wound patterns ensure high efficiency and long lasting performance. The KW811-2 features a raised ridge grooved design which provides a significant increase in surface area. Please note these cartridges do not have the decorative end caps. These cartridges are made in the USA of FDA grade polypropylene. This replacement cartridge bundle is an ideal choice for the value conscious consumer. The cartridge should be changed every 6 - 12 months or upon noticeable pressure reduction. To provide prospective to the micron sediment entrapment rating it is important to note the naked human eye can see down to 20 micron and a human hair is 100 microns in diameter. The industry universal dimension of 4.5 inch x 20 inch makes it compatible with 3M AP802 and many other filter housing manufacturers such as Pentek and Culligan. 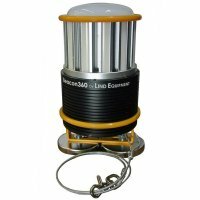 The smaller the micron rating the better the entrapment capability. Shrink Wrapped for Purity.